Using Crunchbase data from 2005 to 2012, I’ve plotted the follow-on rates by size of seed investment quintiles across 2906 companies in that period. Startups who raised $300k or less in their seed raised Series As about 12% of the time. Founders who raised between $300k and $600k doubled their odds of raising an A to better than 24%, and those who raised between $600k and $900k increased the probability an additional 50%, reaching 33%. After that point, the marginal capital demonstrates diminishing returns. 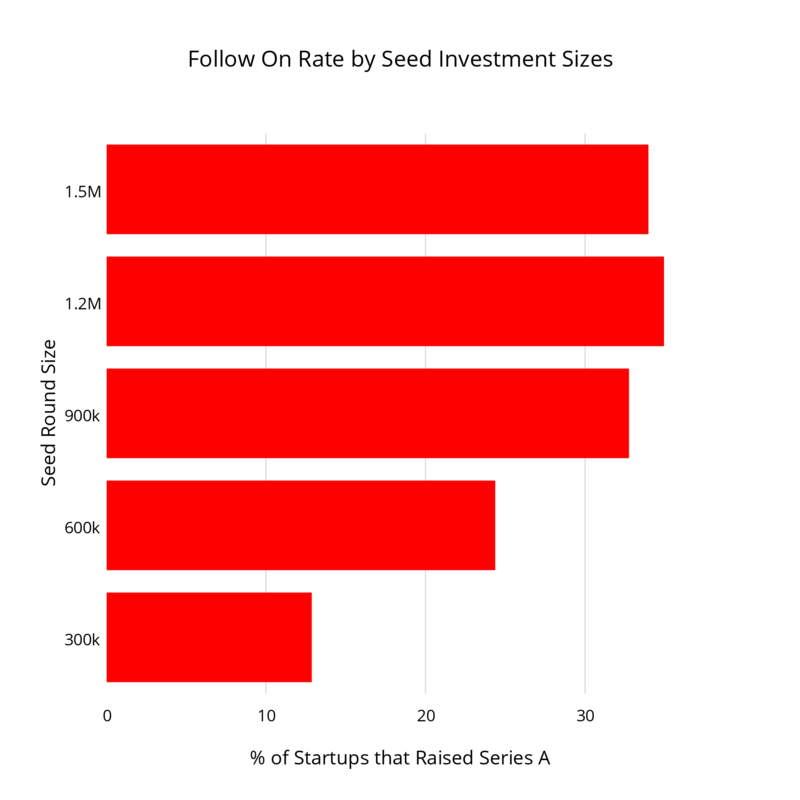 The data indicates that larger seed rounds substantially increase the odds of raising a Series A. This could be due to a number of reasons. First, founders with larger seed rounds benefit from more time to establish product market fit. Second, the additional capital enables seed stage startups to be more aggressive ramping the business either through marketing efforts, recruiting efforts or other tactics. Third, larger seed rounds likely have one or two institutional investors who have invested the substantial majority of the round, and given their larger fund sizes are willing and able to lead the Series A. More runway implies better odds of success.